A professional biography provides the reader with a summary of your career as a mechanical engineer. It enables them to quickly determine your qualifications and experience in the field and see some of your accomplishments in the field. It can be a useful tool for marketing your mechanical engineering skills to potential employers or future clients. Production and mechatronic engineering, etc. 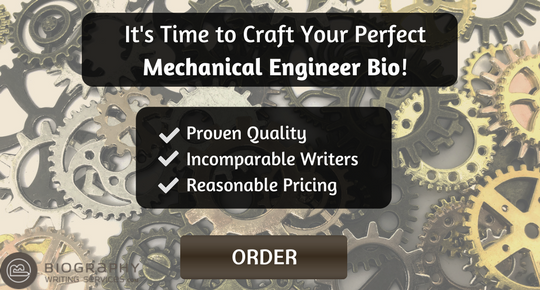 In order to write an effective mechanical engineering bio, you need to determine the purpose for writing it and who the intended audience is. The purpose and audience the bio is written for will play a part in how the biography is written and its content. Are you trying to find new clients for a consulting business, attract the attention of potential employers or some other purpose? After identifying the purpose and audience for the bio you can then plan how to write it. A short and catchy professional engineering biography is a highly important part of launching a Mechanical Engineering career. Often, it can be overly time-consuming to conduct lengthy research on the various job positions and career information and news. 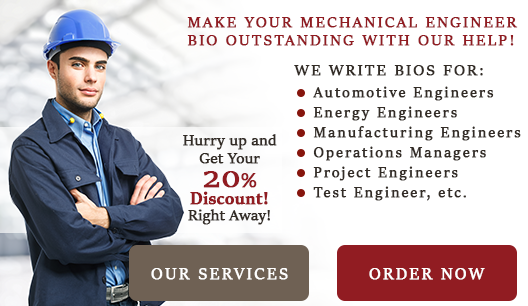 By following these easy steps you can effectively write a mechanical engineer biography, these steps can be followed to write an impressive biography of a mechanical engineer. First, identify yourself along with for whom you’re writing and why. Start writing in the third person. This is your ‘time to shine’ moment. Your bio should sound as though it were objectively written, although make it clear that it is about you as a mechanical engineer. Start with your name in the first sentences. Write your business. Like in Mechanical engineering, you have to drop your profession and activities in there first. The readers have to be bowed and tempted to keep reading. Let your personality shine Include some interesting unique details about yourself. Try and ask yourself, what makes you different and stand out from the rest? This could be a funny and relevant fact about yourself, or you can try and inject some light-hearted humor in your biography that you think your readers would appreciate and take interest in. And finally your contact details. Such as your landline, mobile number, address and hours of operation. Your professional bio shouldn’t exceed more than one page and may often be less. It should be written in the third person using a narrative style of writing. Short paragraphs are better as they can be scanned more easily by the reader. Write succinctly using language that is easy to understand. Avoid using technical jargon unless writing a bio targeting other professionals in your field. The professional biography should be free of any mistakes in spelling or grammar. Writing a biography for Mechanical Engineering is to be concise. As inspiring people have short bios so be short and to the point. Write just for the real audience. Write your important facts first. Direct away from subjective adjectives. The professional biography basically establishes your credentials to do something, such as offering your mechanical engineering skills on a consulting basis or to fill an available job opening with an employer. The content you include should be relevant to whatever your particular objective is. Your name and what you do should be in the first sentence of the biography. Don’t include everything in your bio. Only include the things that are relevant. If you have plenty of information you could include, select those that make the strongest case for you. Once you have clearly established your credentials and qualifications there is no need to go on and on. Writing a professional biography takes time and effort. 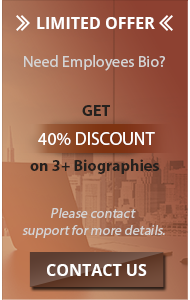 If you are unsure of the best way to write your bio or lack the time, our service can do it for you. 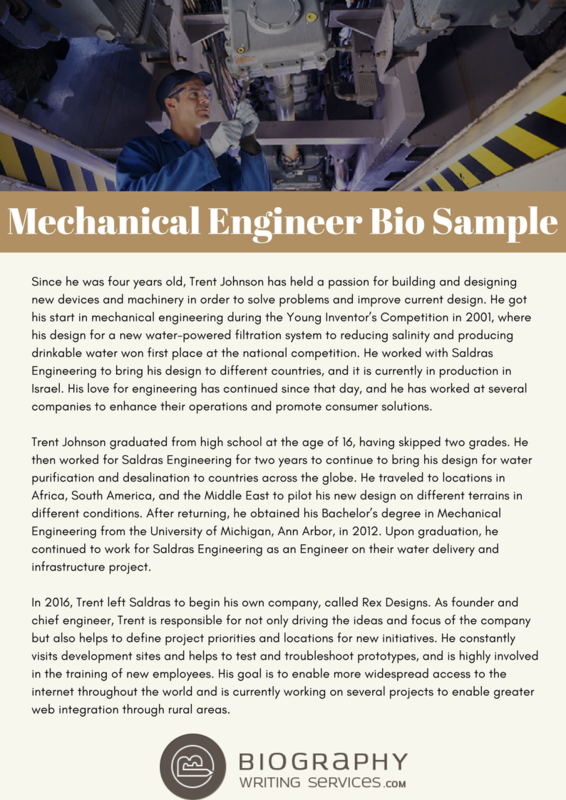 Contact us for a well written mechanical engineer biography designed to achieve your objective and tailored to your specific requirements!